Join our friends for a Biochar Demonstration! Join Doug Moore and Karl Kaufman at Doug’s farm in South Lyon, Michigan for a low-tech biochar production demonstration. 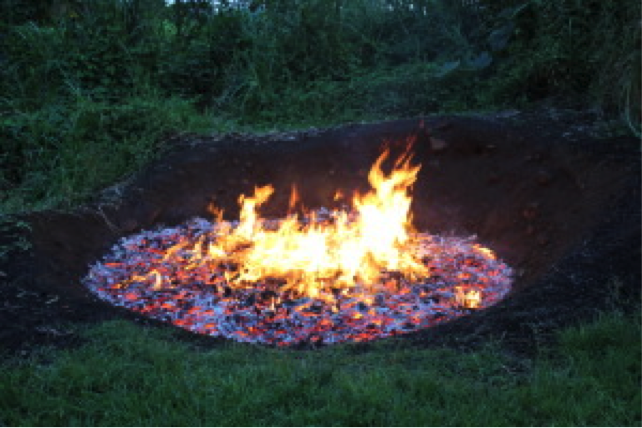 Biochar is charcoal from biomass, which effectively sequesters carbon for hundreds to thousands of years. We will utilize the Hawaiian pit pyrolysis technique popularized by Josiah Hunt. Local wood and biomass will be converted to char, and participants will take a bag of Biochar home to experiment with. Techniques to “charge” the biochar with nutrients, and the value of carbon sequestration will also be discussed. Handouts describing the process and associated information will be provided. Biochar has been held up as part of a sustainable solution to climate change, by sequestering carbon and preventing its return to the atmosphere as greenhouse gas carbon dioxide. Biochar has also been documented to improve soil fertility by increasing resident soil carbon with resultant improved microbiological populations. This further amplifies carbon sequestration, as well as improving moisture and nutrient retention. The deep prairie soils of the Midwest, and the man-made Terra Preta soils in the Amazon are a result of char.